Thanks for the responses. It's just me and my SO in the house, and she is definitely not on the same page with my interest in hoodoo. I might be able to light some candles for a little while in the middle of the night, but I can't leave them up long enough to burn out without risking her waking up and wondering where I am. JW, the Crown of Success spell kit has a mojo in it, and the process for working with that is pretty easy, so that's where I'll start. And, like ShadowyEmbrace wrote, I think the benefits will ultimately be worth it. I wore crown of success and attraction oil to our back to school teacher's conference today. I have only been working at the school for half a year so far. I started in the middle of the school year, so I hadn't had a chance to get introduced to the whole staff yet officially. So the principal introduced me to everyone along with all the new teachers today, and I got a huge and REALLY long applause and lots of people came up to me and expressed that they were so happy that I am here again this year etc. I really finally felt like I belonged. Hehe and one of the cute teachers came and sat behind me and kept nudging me and trying to keep up a conversation with me during the speeches. I Loved it, it was like highschool all over again! My husband is a teacher and we use crown of success products for him on a regular basis--I LOVE crown of success! LM Crown of Success and VanVan are two of my favorites! Earlier this week, my bottle of LM Crown of Success broke due to my own clumbsiness--It is an EVERYDAY part of the start to my day! I swear-- I kept the broken bottle glass shards and all-- with whatever oil and herbs that were in it (until I get my replacement) -- and I immediately ordered through LM for not one but two bottles!! !---And a bunch of other supplies--one of those supplies, in the list of about 20 items, was some Attraction Oil. I ordered that one as a treat TO ME FOR ME (in addition to my normal list of LM money, LM protection items new great LM Products ) as I am actively looking for a desirable significant other! Attraction from what I have read is great for love, money and business and I can't wait to get it! Crown of Success is super powerful! I've been wearing Crown of Success when I go out to find a job to "be successful in what I do today", which I haven't achieved yet, but the other day I was wearing it and happened to be too lazy to turn on my mp3 player in the car so I was listening to the radio. I heard a station was holding a contest for tickets to see my favorite band which I've been bummed about not having the money to get tickets, so I entered the contest at the last minute not thinking I'd win cause I never win anything but figured I'd try, and I just got the call saying I won! I'm so super excited I can hardly sit still. Wasn't what I was expecting to happen but it's still just so great words can not express. Re: Crown of Success is super powerful! Hmm...Ive been wanting some tickets from the radio too lol. I think I will use this! Thanks for sharing. Once you finish with the kit, you are done. If you like certain products in the kit, such as the herb baths in this one, you can always re-order them as individual items. I have to assume it was the oil, I have never won a contest before in my entire life. Thats it, I'm ordering this oil. Have heard too many positive things about it. Crown of Success is a necessary oil to have it can be included in many positive spells. I find it useful in love, success, career, power and many types of spells that involve successful endeavors. Great and continued success Ellis19. We love hearing (reading) positive results...and don't leave out the strength you have in the outcome Ellis19. Side question, are you asking 'if you have to redo the bath within a period of time?' If that is the case it is up to you cush nebo. But to continue the work, anoint yourself with the oils and follow the language used in the instructions...sprinkle the sachet powders etc etc ...wash your clothing, bath or mop your home with the bath crystals ...these are methods to employ and keep the work going. tongue tied, so I thought I would wear crown of success for a little help. The interview went very well I was confident and answered all the questions Intelligently. I have had a phone call this morning with the job offer subject to references so I am very pleased. Whatever happens the interview was a success and I believe it to be down to the help of crown of success. Congrats, indeed! I hope you get the job. would this kit be appropriate for someone seeking a scholarship? Yes, it is used for all types of career, job, business, and school successes. You can fumigate it in a cleansing incense, such as Uncrossing or VanVan. Or you can gently wash it in an herbal tea that you've mixed together from cleansing herbs. is it imperative that i get up before dawn to take a bath every day of the ritual? or can i do it when i wake up. Yes. It is traditional to do it before dawn and dispose of the remains as the sun is rising. Of course there is no one whose going to police your spellwork, so if you do it at a different time, that's completely up to you. However you will not be working the spell in a traditional fashion. Setting the alarm clock and getting up to begin your rituals can be a very empowering thing. If it is against your normal routine then you are putting the extra efforts in to ensure that your work is done properly. Your making the physical commitment to your spiritual work. It's just my opinion, But I think giving this dedication to your spells will help them to better manifest your will. Doing spells according to the instructions provided is as important as the spell. You are learning how it is done traditionally as Devi mentioned. 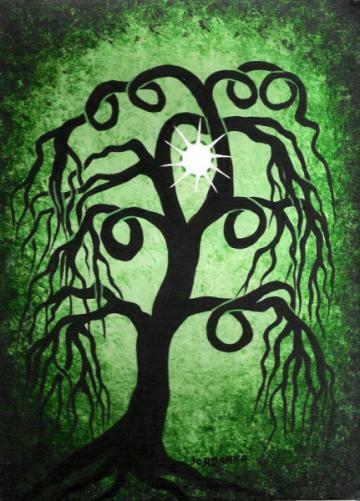 But if something happens and you failed to wake before dawn, continue your spell until it is complete. I feel its' completion is what you are working toward, and understand while it is traditionally performed that way, your timing may vary, it comes with experience. I know I feel empowered when I rise early and complete everything, you just get a certain Crown of Success feeling. Good Luck newbutstrong! 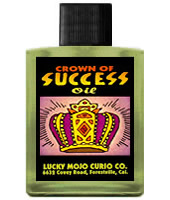 I recently got my first order from Lucky Mojo, and one of the things I picked up was Crown of Success oil, because I'm doing a lot of important work that I want to help along--both for my job and for myself. Well, after a full course of uncrossing baths and a Van Van ritual, I was ready to start trying Crown of Success. I burned a candle dressed with it and used it as an anointing oil, and WOW. First, it smells delightful: light and fresh and clean, not overpowering, but with a subtle scent that sneaks right into you. I'd wear this as a perfume even apart from its other qualities. And second, wearing it... well, it's hard to describe, but I feel like I could take on the world. I'll update with more concrete successes as they happen--which I'm sure they will. I agree coraa, Crown of Success is one of my favorites. Every January, I have a challenging (not bad, but challenging) period at work: lots of high-pressure, high-profile stuff to do, including public speaking, interacting with customers and the public, interacting with the higher ups (including the CEO) at the company, travel, schmoozing, etc., etc. This year, I didn't have the full Crown of Success spell kit yet (although I do now), but I had a bottle of the Crown of Success oil, a lodestone, and a John the Conqueror root, and I figured I could get started with that--on the principle that some help now is better than perfect help too late. I anointed the lodestone with the oil (and with prayer), told the lodestone that I wanted it to help me draw success, and fed it some magnetic sand. I also anointed the root with a bit of the oil and wrapped it in a handkerchief, and carried it on my person as a lucky talisman. While I was doing this particular period of work, I felt more calm and full of confidence than in most past years--and that was even though this was one of the more objectively challenging years we had! I was able to keep my head when things didn't go quite right, and to take advantage full advantage of it (in a good way) when things did go right. And every morning, praying and anointing really seemed to get my in the right mindset to take on the day (and the world). From a purely aesthetic point of view, the clean, powerful scent of the oil made me feel really ready to go. In short, I felt like I had more power, confidence and, well, success than in years past--exactly what I was hoping for. When I got home, I put the John the Conqueror on my altar along with the lodestone, fed the lodestone again and thanked it and asked it to keep working for me, and burned a candle for them both (as well as for my angelic patrons, to thank them for interceding for me). I'm going to keep those two as a permanent part of my success altar, and I'm definitely using the full Crown of Success spell kit to kick off my next major project! I'd definitely recommend it for anyone who needs that little additional confidence and oomph when tackling a task. Great ritual ... love it! Thank you for sharing your fantastic ritual with us coraa! Thats great news, I am glad for your success. I'm working on a creative project (finishing my novel! ), and trying to figure out the best work to do to promote success both with the creative work of finishing it and with the possible saleability and success of the book afterward. 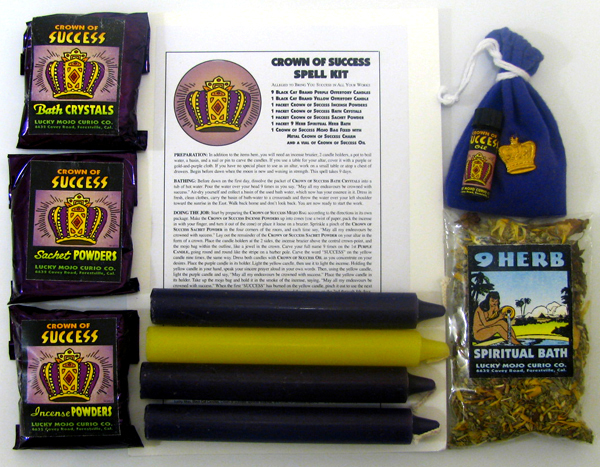 I have both the Crown of Success spell kit and the King Solomon Wisdom spell kit, and I'm not sure which would be better for this part of the process! I have had great personal success with Crown of Success, so there's that, but King Solomon Wisdom is also appealing for its influence on mental clarity and so forth. Why not do both? 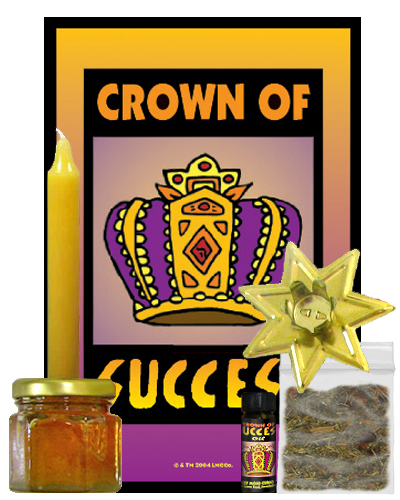 In most of success work I combine Crown of Success with King Solomon's Wisdom products. This gives you eloquence, success, mental skill, wisdom to make right decisions, and an all around great base for most products. Consider using products like Road Opener and Attraction to help the work along. That makes sense! They do both seem to be fully appropriate for the work, and I very much would like the influence of both on the work. Would it make sense to do them sequentially, or simultaneously? The spells are pretty compatible, but I'm not sure whether it makes more sense to do a full course of one and then a full course of the other, or to combine them (and if I combine them, should I combine the two in the sense that I mix the Crown of Success and King Solomon Wisdom incenses and burn that, and then mix the Crown of Success and King Solomon Wisdom bath crystals and bathe in that, or should I do one bath and incense the first day and another the second rather than combining them?). Or does it matter? I'm trying not to overthink this too much, but I also want to not goof it up--especially as I've had such good luck with Lucky Mojo supplies and hoodoo methods before! If you have spell kits then do them separately by following the instructions clearly. I dont' recommend combining the kits unless you know what you are doing. I was at wits end, with my kids. They were constantly fighting, bring home bad grade, and talking back. I am not a loosey goosey mom. I do my best to enforce rules, but I was getting overwhelmed. So I ordered Lucky Mojo brand Crown of Success, King Solomon, and Clarity oils from Miss Bri. I snuck these oils into their shampoo, conditioner, and lotion; and prayed over it. To be honest.... I was so busy that I ended up forgetting about it. With in a few days later my kids were getting along better, fighting less, talking back less. And with in a week or two my kids started bring home good grades. Oh and let's not forget.. they were even picking up after themselves, without whining. I was so amazed I started thinking "WTH? ", then I remembered the LM oils. ! So I highly recommend these oils! Thank you, Catherine for making awesome products! Thank you Miss Bri for your great customer service and being so helpful!! Love your story! good for you! This is a wonderful share witchy_woman and Great advice from Miss Bri! Thank you! I love it! Thank you for sharing this story witchy_woman. I know what it is like, when you've tried everything you can think of. Yet nothing works. So if this helps you, I'll be happy. Good luck, all! First I want to say a big "CONGRATULATIONS!!!! ", for getting out of that relationship. I know how hard it can be to get away from that kind of situation. I used my CoS oil on my kids, with a couple of other oils. I snuck them in to their shampoo and conditioner. lol It does work! First congratulations on your work! Second, I actually have candles that burn at my office I know not everyone can do that but thankfully, I can. I too, work with Crown of Success and King Solomon Wisdom both for me and two other family members, one of them is my child. I have worked with The full line of Crown of Success from the oil to the Vigal. It is in my top five of favorites!!! Crown of Success is also in my Rootworker's Special. I also agree with jwmcclin's reply, "I had to put some work into what I was petitioning". Best of luck and continued Success to all here at the Lucky Mojo Forum!!! Katie_Did1111: I cannot commend you enough on getting out of that relationship. I know first hand how tremendously hard it can be, yet seem so easy to those outside of said relationship. My mother and I were locked into an extremely brutal abusive relationship with her then boyfriend for almost 5 years. It was a terrible time in my young life and now, 25 years later, I have come to understand what she had to go through and how tough it was for her. We had to eventually leave in t he middle of the night in a rented U-Haul after another of the NUMEROUS overnight jailings of this man. I'd like to start a honey jar as an ongoing work for general success in matters of school and work, but I was wondering which kit to choose. I'm torn between Crown of Success and King Solomon -- any suggestions? Thanks! Re: Crown of Success or King Solomon honey jar? I would work the Crown of Success honey jar, although, I would start with the Spell Kit followed by the King Solomon Spell kit. May I just add that the incense for COS and KSW is brilliant when your studying. I swear my head just clears right up and I find that i'm just on it. Thanks for the suggestions! I'm going to order the CoS honey jar when my cash comes in, and might throw in some King Solomon incense. While I'd like to buy the spell kits too, I need to be careful with my funds until I either get work this summer or get back to the monastery kitchen in August. I think the summer break would probably give me good enough time to get the honey jar working well before school begins. When funds are the issue, you definitely have the right items on your list. I like the kits because they include everything and so much more to work with over periods of time. The honey jar is a nice steady long term work. Good luck! I purchased a crown of success vigil candle for my reader to help with her business, and she had customers coming in for readings like crazy. And the candle smelled wonderful . Hi Katie, I have used Crown Of Success products for sometime now. I use the oil to dress glass encased candles, Photos in any works I do. I put some in my oil difuser @ my business is is a great stimulator. I use the powders on letters or peditions as needed. I even put a little in my shoes. I love to burn the loose incense as well, It really raises the vibration level. I put the oil on a cotton ball in my sons pillow slip. I even put the powder in his jean pockets after a wash. I also put powders on my customer receipt book & dust my business cards as well. I could go on & on. I have had wonderful results with all the products. FYI another of my favorites is Indian Spirit Guide oil & Van Van they are tremedous. Make no mistake the Lucky Mojo products are the real deal. I have tried others, no comparison. Blessings to you. Great Share DonnaLee!!! Outstanding advice!!! Be Blessed now and forever my friend!!! Those are definitely great suggestions, and I love how you provided an endless way to use the products in all aspects of your life. Hello all! I found a COS Kit that I purchased last year in late April. I had forgotten I had it. I only used it once. The sachet powder, the incense, and the bath crystals is what I used. I haven't used the 9 herb bath, the mojo bag, and the candles yet. Everything still smells the same but I'm a little skeptical. My question is, since it's over a year old, could I still use it or should I purchase a new kit?